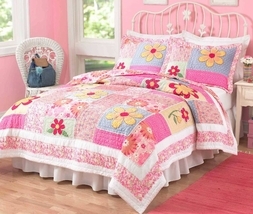 Bursting with color and flair, the Olivia quilt set will spell f-u-n and brighten any bedroom. Featuring an array of appliqued flowers set on textured patchwork in shades of pink, yellow, mint green, and powder blue. Patchwork blocks are trimmed in ric-rac accents (zig zag trim) which adds pizzaz. 100% Cotton/Fill. Quilt set includes quilt and two standard shams (one sham with twin quilt). Full/Queen measures 86" x 86"